One of the very first steps to setting up a website is to buy a hosting plan. Buying a hosting plan is not difficult, but most new bloggers find it challenging to understand which web hosting service is the best choice, which plans to buy, and how to make the purchase. 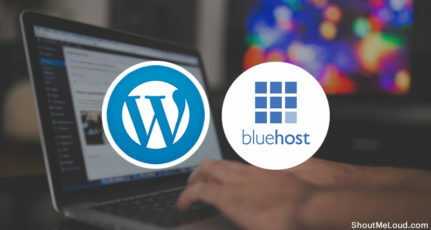 In this guide, I will help to answer the questions related to what a new blogger needs to know when buying a hosting service for his website. 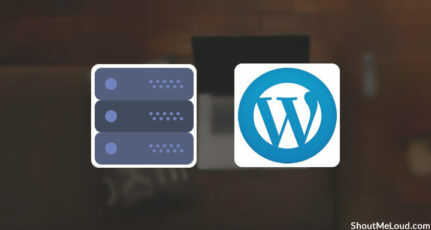 If you are completely new to hosting for your site, I recommend that you read my previously published article, A Beginner’s Guide to Webhosting Plans. In this tutorial, I will be using Hostgator as an example. 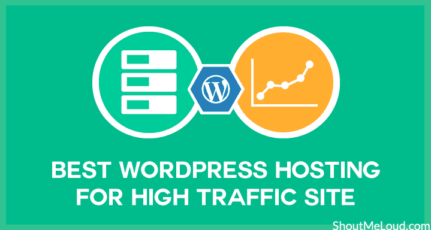 If you are new to Hostgator, it is one of the best WordPress web hosting services available. I also offer a discount coupon here, which will help you to save money on your hosting plan. Hostgator offers many plans, but for a new website (WordPress, Static, PHP, etc. 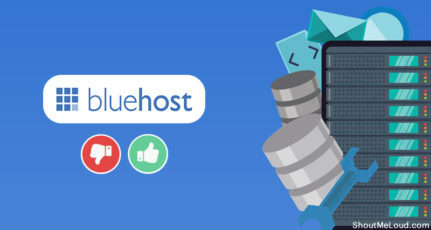 ), shared hosting offers a good start. 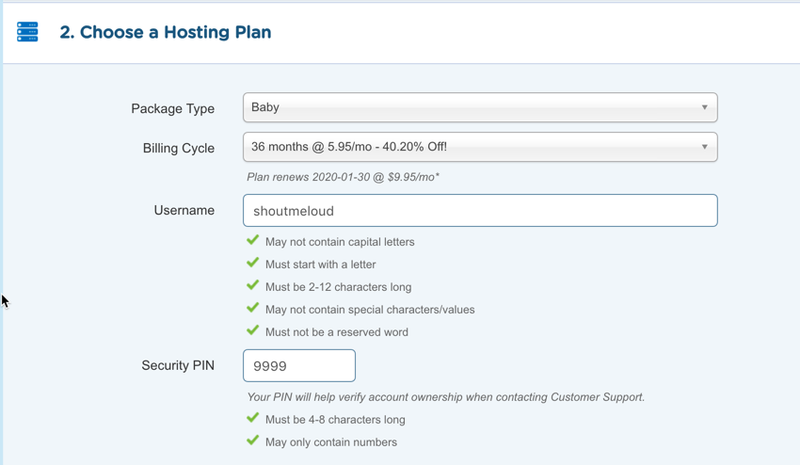 In this tutorial, I will be buying Hostgator’s “Baby” plan for one year. The Baby plan offers unlimited everything, and it is especially perfect for any blogger who would like to host more than one website. Hosting service charges are usually based on the package you are buying. The cost of hosting increases with the level of the package you buy. For example, a cloud and dedicated servers are the costliest forms of hosting, followed by VPS, and then shared hosting. Go to the Hostgator homepage, and click on Webhosting in the navbar or click on get started now (follow screenshots below). On the next page under the “Baby Plan” dropdown, select one year or more. I suggest booking your hosting for at least two years. Here you can select the hosting plan you want to have. By default, it would pick the hosting package that you have selected in step 1. What really important is the billing cycle. My suggestion is to get hosting for 24 to 36 months period.This is the last page, where you will complete the purchase of your Hostgator account. You can change the duration of hosting from here. Select a username for your account, as well as a security pin. Reason being, as you increase the tenure, overall cost decreases. Moreover, in the next step, you will find a discount coupon worth 30% of total bill. This is your only chance to get the discount on your purchase. Note: No hosting offers a discount on renewals. The only way to get the discount is at the time of your first bill. You can learn more about this on my earlier post on how to save money on hosting renewals. In the “billing info” field, you need to give your address and phone number. I suggest that you double check this information making sure it is correct, as they are going to call you on your provided mobile number to verify the intended purchase. This is to ensure the security of your account. Here you can also select your payment method: PayPal or Credit card. If you select PayPal, on the next page, you will be redirected to the PayPal payment page. 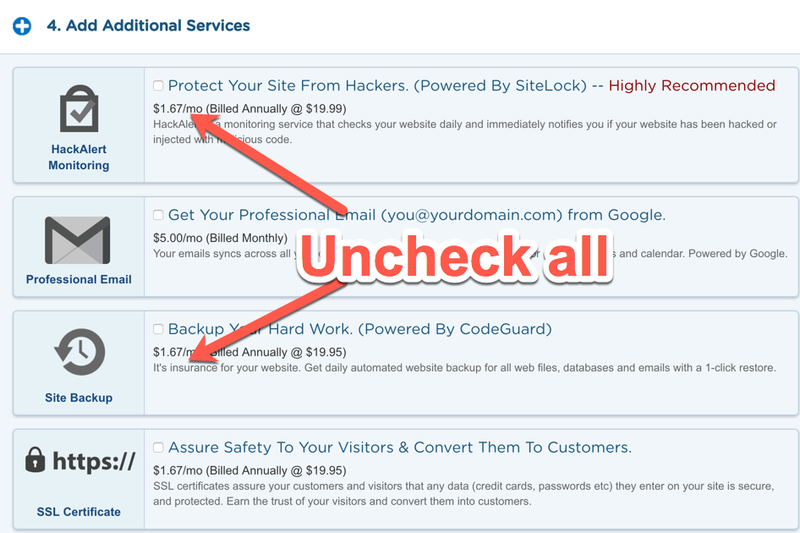 In the additional service section, ensure you uncheck everything. Most of the paid add-ons are not worth is as we have the complementary free alternatives. 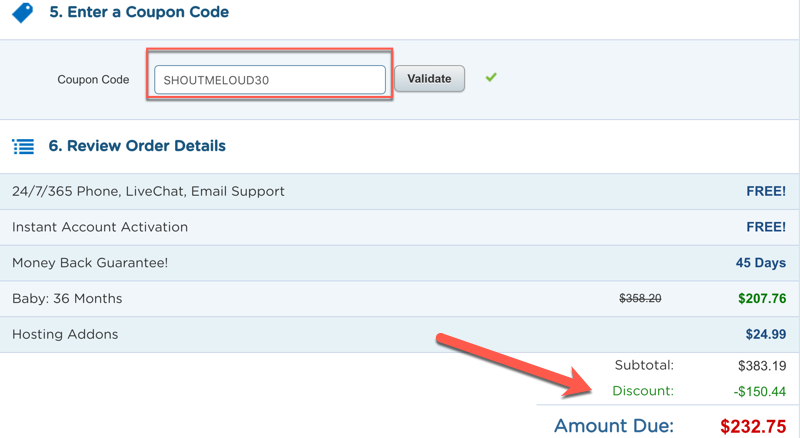 In the coupon code field, add “SHOUTMELOUD30” and click on validate. This will give you flat 30% off on your total order. Below the billing info, you can see the complete details of your order. Before you move ahead with the order, be sure to verify your order. Once you are satisfied, click on “Create Account.” Depending on your payment method, you will be taken to the PayPal payment page, or the “successful order placed” page. In about a minute you will receive an email from Hostgator confirming your order, and within an hour you will be receiving a call with your new hosting account details. 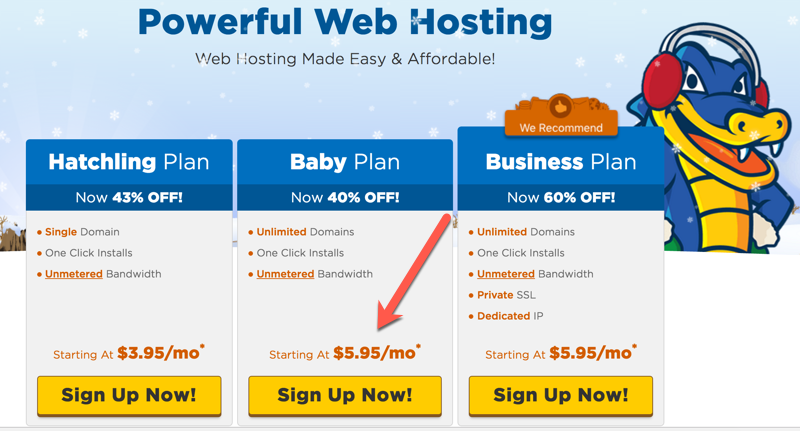 I hope this guide will help you with the process of purchasing a hosting plan. If you are confused or have questions, feel free to let me know via the comments section below. Also, if you find this tutorial informative, please remember to share it on Twitter, Google Plus, and Facebook. to impresive. smart work that’s why you’re so good in blogging business. awesome discount by hostgator.. i am also promoting the same on my blog..
Hey Guys, Go for it… Last year Harsh gave me a BlackFriday Coupon and I’m really happy with Hostgator. A must read article for newbie’s. Nice info. By the way harsh are you hosting your blog in dedicated servers or at host gator? I helps people who want to go for it but are confused and don’w know how to do it. I never did get my phone call from them, either. Hmm…. Thank you for all the tutorials here. I will be using several of them over the course of the next weeks! It is great tips on saving money on hostgator.I wish i would of known this tip in advance. Thanks Harsh for the great tips. It awesome discount to start wordpress on hostgator sir. Am also using same hosting, can you tell if there is any discount on renewal plans? These ways are very simple and very much useful, as a beginner level these helped me a lot thanks fore sharing these kinds of useful and knowledgable informations. Sir, How you make your Thumbnail Pic for your Blog Post? Are you using any free online website? I guess you are asking about featured image. Well, it is made in photoshop. However, you can use CANVA to make images. it is free and amazing to make images. Sir, How do you make it /recommended/, instead of an affiliate link. Please help me so that i can also make that too. Great offer. But unfortunately I cannot use this offer now as I already have a hosting plan from other hosting provider. But I can surely recommend this offer to my friends. 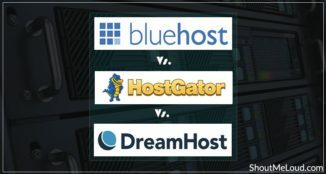 Thanks for sharing this info on hostgator hosting and the coupon code.